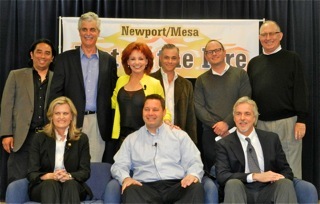 The hour and a quarter video of the recent Feet To The Fire Forum held at the Costa Mesa Neighborhood Community Center on April 5th is now available for viewing. 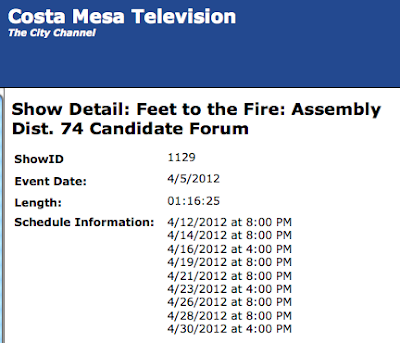 It can be seen via streaming video on the Costa Mesa site by clicking HERE. Or, for those who live in Costa Mesa and have either Time Warner Cable (Channel 24) or ATT U-Verse (Channel 99) connections, you can view it through the remainder of April on the schedule listed below. It's my understanding that CMTV will also include it in the playlist for May, too. Colin McCarthy should be ashamed of himself for the dishonesty, lies and hypocrisy. How can the head of the CM Tax Assoc. misrepresent the cities financial information so much? Fiscal Year 2010-2011 the current council had zero effect. The numbers and the city rebounded to show a $3.8 million surplus based on recovering revenues and cutting about $22 million in expenditures over the 2 previous years. Check out the February 28th 2012 budget presentation link posted below. This year this Council has actually increased expenses about $3.6 million to where the same revenue as last year that produced a $3.8 million surplus is expected to drop according to the city's own financial officer to $200K. I see McCarthy likes to misrepresent the truth but everyone can check the validity of his claims on the city website. For all of this, our Council majority has been personally attacked, harassed, threatened and even had their spouses accosted while shopping. There is a vocal minority in this City that does not want to see any fiscal reform. To them, a QUARTER BILLION DOLLAR unfunded pension obligation is okay. To them, $350,000 a year firemen are okay. To them, our money should all be spent on salaries and benefits and not on improving our City. We all know that this fringe element represents the small minority of residents in our great City. However, it is this vocal minority that is speaking up. They speak at City Council meetings, they write hateful editorials in the local media and they effectively pretend that they speak for the majority of residents. "Colin McCarthy's latest misrepresentation of the facts. And who is spewing HATE?" This is why they call him "Colon." The city’s standard practice has been to include the specific starting time on notices of City Council meetings, including meetings following another session. But the agenda for Tuesday’s special meeting to decide whether to pay a consultant $154,000 to conduct a special election in June on the proposed charter didn’t include a starting time. Instead it stated the special meeting would start after the conclusion of another meeting. “I thought it was bizarre that they didn’t have a time,” said Sandy Genis, a former Costa Mesa mayor. The city canceled the meeting just hours before it was set to begin, citing legal concerns over the notice. It hasn’t been rescheduled. The state open meetings law, known as the Ralph M. Brown Act, requires special meeting notices to “specify the time” of the meeting. The agenda for Tuesday’s special meeting stated only that it would “begin immediately following” a study session. The decision to deviate from standard practice and not specify the meeting’s starting time was made after discussion withf top city managers, according to the deputy city clerk. In the past, City Clerk Julie Folcik had included starting times on all special meeting agendas. But Folcik has been on administrative leave after the city missed the state-mandated filing deadline to place the charter issue on June's primary ballot. In Folcik's absence, city management and city clerk staff discussed the timing issue before the agenda was posted, said Deputy City Clerk Christine Cordon. She would neither confirm nor deny whether top city management rejected a desire by city clerk staff to include a specific meeting time. “We decided it would say ‘immediately [following the study session],’ ” said Cordon. Lobdell didn’t return several messages seeking comment, including a question asking whether top city officials rejected a desire by Cordon to include the starting time.